duff and Morty like this. So I ordered my VHW on Monday and my order status has been "Pending" ever since. I have never recieved any shipping information and my bank account hasnt been charged yet. I emailed Vriptech this morning about what is going on with my order and have not received a reply yet. A little disappointed with the service so far, but I am still eager to try this thing out. duff and lazylathe like this. FWIW...I placed an order with them this week also @babaganush and my order still says pending. No communication from them either. Sounds like they're good guys though. Nice video @duff ! Can't wait to see how you like it compared to your other favorite flavor savor. And no, I'm not talking about the Lithe. KidFated., Whissmu, lazylathe and 1 other person like this. I placed an order with them this week also @babaganush and my order still says pending. Do they not want our money? The charge did show up on my bank account yesterday, so maybe they were waiting for that, I dont know. I'll let you know if theres any updates on my end. Why not give them a call and ask? Check the time difference first before calling, they are located in California. I know that @ShadowVape spends the entire summer up in the mountains with hardly any contact with the outside world! What a life!! Morty, Whissmu, babaganush and 2 others like this. Morty, lazylathe and Whissmu like this. trust them !! They are very good people! Great communication from vrip today with tracking info. lazylathe and Whissmu like this. I didnt get it in yet but would anyone know the best method to clean the glass on the wand? 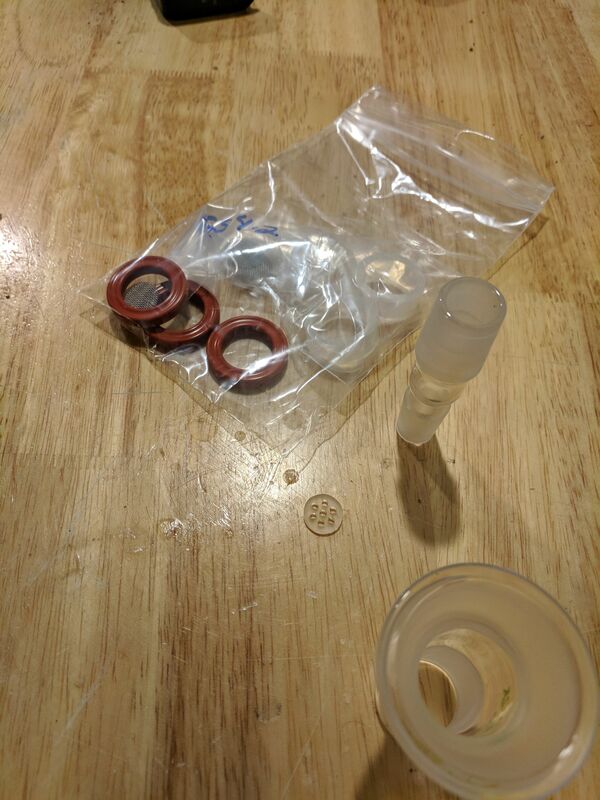 Can I just carefully dip the glass part of the vape in ISO and/or water and then scrub? Or is it recommended to unscrew the glass from the vape and then clean? Although that would probably void the warranty. The Glass should never get dirty at all. Only the silicone ring needs to be replaced, that is all the mantenance required on the wand. If it is getting dirty you need to lift the wand before finishing your hit to prevent blow back of vapor up the wand, very water tool dependant on that though. duff, babaganush, Morty and 1 other person like this. What about like a first time cleaning from the manufacturing process, or is that not necessary? I usually try to do that with all my vapes/glass. The glass is cleaned after manufacture, so the assembly should be clean. Also it is glass, so no oils or residues from manufacture. My 1st wand was perfectly clean, inside and out. If it really bothers you, unscrew the glass cover and clean it with ISO and then hot water and allow to dry completely before reassembly. Be very careful when tightening the screw!! You break the glass doing that and you will need a new expensive cover. Morty, babaganush and duff like this. @lazylathe Gotcha! If its been cleaned after the manufacturing process then it should be good. Thanks for the info! lazylathe and Morty like this. So I just got my VHW in, and I didnt try it yet but I noticed the ceramic heating element isnt centered inside the glass. Im not sure if its physically touching the glass but Im a bit nervous because if it is then it may cause a break. Is it as simple as (gently) taking off the screw on the side and straightening out the heating element? edit: took off the glass which was simple enough, and I dont think the heating coil is touching the glass directly, but I still wasnt able to center it anyway because it would just fall back at that angle. The metal ring that holds the heating coil is loose though, and theres 3 holes for I think screws, but I dont have any screws on mine--is that normal? duff, Whissmu and lazylathe like this. if it's all normal !! 3 missing screws is how I received mine as well. The element is hanging within the glass and does wiggle. babaganush and lazylathe like this. Is the missing screws normal or should I contact Vriptech about it? Well after I placed my order with vrip the package was marked as delivered but never arrived. I contacted them to let them know and @ShadowVape immediately sent out a replacement that I received a couple of hours ago. I ordered the 14mm full bowl kit, spare glass screens and some legacy tip seal kit (they even threw in some newer red seals that I hadn't known about). I had been using my main 18 to 14 wpa and an older angled vrip top cap. I'm very glad that I got extra glass screens as I will be loosing them. The screen fits very nicely in the ledge on the wpa but it does fall out easily. Some material did fall through the screen into my drop-down. I'm also glad to have the OEM bowl setup. It is a much better fit than my daily wpa/older angled cap combo. They are expensive though. The hits, my first ever with 100% glass, we're unbelievably pure and smooth. There wasn't a bad hit in the bunch. I think heat is set to around 75-80% although I really need to mark the dial because it is no fun trying to focus in or set it. Took a primer followed by two regular draws and stirred (which is very easy). Took one more hit and called it quits. The material was pretty dark for me, but was evenly vaped. At this temp I wasn't able to totally milk my piece but got very large hits. Vrip's customer service has really been stellar and the taste on this all glass setup is unreal. lazylathe, Alexis, invertedisdead and 1 other person like this. I need to get the straight adapter and glass screens again! Expensive but they work like a dream. My original wand has made a trip around the world and is back in Canada! I made a mark on my dial that the new owner still uses, maybe slightly cooler. That was my go to for a perfect vape session! All i did was make a slight depression on the decal to mark the spot! Alexis, Morty and duff like this. Thanks @lazylathe I had actually looked at @splitz's pic a few times! I'm glad to have that as a reference. Thanks. Of course I forgot to mention that the effects were very potent. I was in orbit for a while there. Zow237, Alexis, Morty and 1 other person like this. Hey Duff, did the wand not quite suit your requirements then? That was amusing watching Vapecritic bamboozled about how to set it up the other night. Man, was he unschooled on all things Vriptech! Unfortunately life really interferes with my ability to have a powerhouse desktop setup @Alexis. But I want to try them all! The vrip was perhaps the purest vape experience I've ever had. That all glass pathway is killer. But the heat up time makes it very impractical for my use case as does the fairly large amounts that I go through when using any of these more powerful vapes. My hope is that once I've put my kid through college (two and a half more years), I'll be able to pull back from work and be a full time enthusiast. If I get there, you may want to make sure that your children, grandparents, pets and anything fragile are all locked up. Don't know what I'll try next but the usual suspects are all very enticing. I didn't get to watch all of VC's feed but it was fun watching him try to figure it out. It did make me sort of sad though. lazylathe, Morty and Alexis like this. Well life goes on eh bud? To be honest Vapecritic's feed did very little to entice me towards the Vrip, rather he helped me be more accepting of the fact that I won't be considerimg it for the near future, after my recent experiences with numerous other heavy hitters I can't tolerate. I mean he spent, how long (?) fiddling round clueless, and never got close to the right technique to milk it up. He really needed you there to hold his hand and walk him though it. You just sat there chuckling I bet, laughing too hard to eventually type "No Bud you dummy, that is the OLD bowl!" He did do a nice little job though at highlighting the Glass Symphony and bringing it under more people's noses. Now THAT is a vaporizer everybody should buy TODAY (ahem..classifieds..ahem)! Thanks for quelling my curiosity Duff, best luck to you finding contentment with your current line up until you can again explore desktop Utopia. babaganush, Alexis and lazylathe like this.